Winter weather got your skin in rough condition? 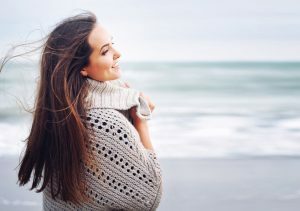 Not to worry, skin issues are common for almost everyone across the country, especially during the colder months of the year. Cold months are usually dry months, which means that you’ve got to change up your skin care routine to stay supple and smooth. Here are some of common skin issues we encounter during the winter months along with some pointers to help you alleviate them. Dry skin is the major villain during the winter. Dropping temperatures mean less moisture is produced for the skin, and what moisture we do produce is usually dried up by the artificial heat we spend most of our time in. This combination dries skin out, which in more extreme cases can cause peeling, cracking, inflammation, and even bleeding. Some dry skin can develop into more advanced conditions, such as eczema or psoriasis. The Fix: Be mindful of your heat sources and moisturize! The lower moisture production in your body is virtually unavoidable, so make sure you are watching out for too much exposure to heat and frequently moisturizing. For example, try blow drying your hair on a cool or room temperature setting instead of warm or hot to avoid drying out your scalp. You can also try taking showers that are warm instead of the “hurts so good” scalding hot you may be used to. Moisturizing your skin with lotions or creams is just as important. The best time to moisturize your skin is when you are fresh out of the shower. Choose a moisturizer that is right for your skin type and don’t be shy about applying liberally when necessary. If you are experiencing more severe dry skin conditions, you can consider more heavy-duty moisturizing solutions. If the condition of your skin doesn’t improve or worsens, consider talking to a skin care professional for advice on a new skincare routine. Many men and women have a dramatically different skincare routine during summer months vs the cold winter months. Acne isn’t just a plague for teenagers anymore, adults are experiencing more breakouts now than ever before, and there are a host of factors for this. Acne occurs when the oil producing skin glands work overtime and create blockages. This increased oil production can occur because of hormonal changes, improper diet, stress levels, and much more. If you’re experiencing an increase in outbreaks in the winter, there is hope for you to improve your condition! 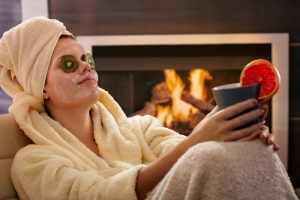 Stress – If you’re breaking out only during the winter and the holiday season, you’re probably abnormally stressed. You’re not alone, the holidays can be stressful for everyone! Make sure you are taking opportunities to get out and exercise to relieve stress and improve your overall health. Diet – When winter starts, dieting ends! It’s common for people to enjoy holiday-related food and drink binges in preparation for the resolutions of the new year, but this could be the underlying cause of your stress. Maintain proper balance for your meals, get plenty of hydration (that isn’t eggnog), and you may see improvements in your skin. New Skin Care Products – Didn’t we just talk about how using moisturizing products is essential for combating dry skin? Absolutely, but it’s also just as important to mind the products you are using on your trouble areas. If you need to apply moisturizing products to areas prone to breakout, just make sure you apply as little as necessary or opt for a light moisturizer. Try cleaning your makeup brushes, this is a huge one for skin problems! Remember to remove makeup at night and cleanse your face thoroughly. Keep track of the things you eat each day for a week. Eat less of the bad stuff, and eat lots more of the good stuff! Regardless of the source of the acne, gentle exfoliating and cleansing products are recommended to help handle acne before it crops up. Yes you read that right, sunburn! Turns out you can burn yourself to a crisp even during the winter. If you’re someone who enjoys traipsing around in the snow on those warmer winter days, keep your skincare in mind. It’s good to get some vitamin D, but burning your skin can make dry skin and other skin conditions significantly worse. The Fix: – Sunscreen! It sure is a simple fix, but many people forget to apply sunscreen before wintery fun activities during the day, especially if they’re hitting the slopes. Be mindful of the exposed parts of your skin that could be subject to sunburn and make sure you apply a generous amount of sunscreen with an SPF of 30 or higher. Your skin will thank you! Is the world of skin care fascinating to you? A future in esthetics may await you! Estheticians provide all sorts of skin treatments to help clients have healthier, happier skin. If you’re interested in helping others feel and look like their best selves, contact us to learn more about our esthetics program and how it can help you become a skincare pro. previous post: Quiz: How Well Do You Know Your Dental Instruments? next post: Which Healthcare Career Fits Your Personality?